What’s the most dangerous thing you’ve been asked to do at work? Climb a dodgy ladder? Work back-to-back shifts? Use equipment without training? Thus began the undercover career of Neil Woods, a young, British police detective who discovered he had a special skill. He could convince some of the hardest, nastiest gangsters in the UK that he was a drug addict, all the while gathering evidence against these brutal individuals and their violent activities. ‘Good Cop, Bad War’ tells the story of Neil’s years undercover. Following him around the UK, it also tells how his initial, naïve belief that he could help people and make a difference was slowly replaced by the realisation that his actions only caused more harm. Harm to individuals, to communities, and to the relationship between the police and those they serve. Genuinely shocking anecdotes are juxtaposed with sympathetic histories of the people Neil encountered. Humour and horror sit side-by-side in this matter-of-fact memoir detailing a reality most of us will never have to confront. 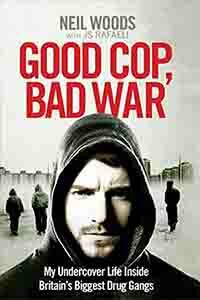 ‘Good Cop, Bad War’ offers an insight into the development of gangster tactics in response to the firmer policing resulting from our government’s punitive drugs policies. It illustrates clearly the effect of handing control of the drugs market to criminals, a global market worth £375 billion annually. Most poignantly, it highlights a tiny number of the innumerable lives ruined by the simple fact that drugs are illegal. Fourteen years of Neil’s life was spent chasing criminals, gathering intelligence on gangs and walking on by those who most needed his help. The homeless, the addicted, those forced into prostitution and those with no choice but to keep on going back to the gangsters who abused them. I challenge anyone to read this book and not be convinced by Neil’s conclusions. After all, when cops say ‘legalise drugs’, you can’t help but ask why.